Quarryhill Botanical Garden celebrates Earth Day on Saturday, April 21, 12841 Sonoma Hwy., Glen Ellen. 11am to 3pm. Free admission; $10 parking (cash only). 707.996.3166. HORTICULTURAL OASIS Fire surrounded Glen Ellen’s Quarryhill Botanical Garden last year, but somehow the plant preserve emerged unscathed. Each spring at Quarryhill Botanical Garden is a lush display, as the largest collection of wild-sourced Asian plants found in the Sonoma Valley blooms throughout the 25-acre space. This year, six months after wildfires tore through the region, yet inexplicably spared the gardens, the season's bloom is a poignant symbol of the North Bay's regrowth. "It's an incredible spring already," says Quarryhill executive director William McNamara. "The garden has really come into its own." Located northeast of Glen Ellen in the Mayacamas foothills, Quarryhill was founded in 1987 by landowner Jane Davenport Jansen. McNamara was a landscape contractor at the time, and says he was in the right place at the right time to help develop the garden. He also began leading expeditions to remote locations in Japan, China and throughout Asia to collect seeds to populate the garden. 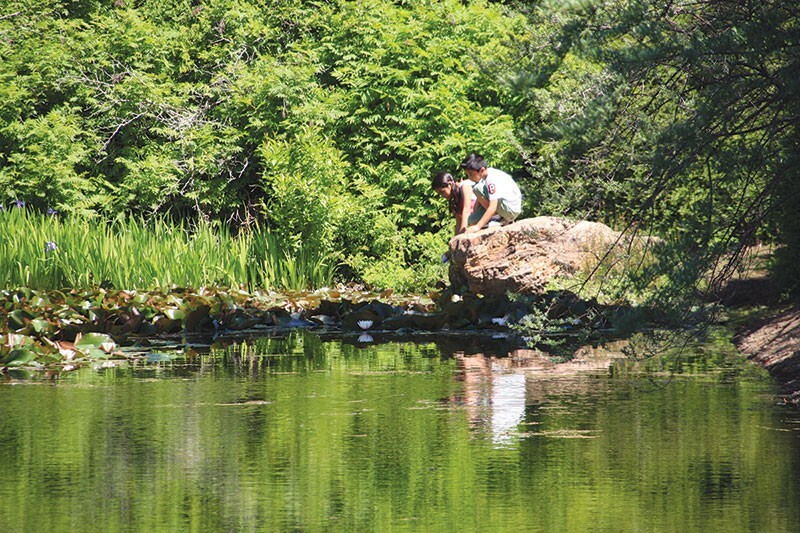 Aside from offering an outdoor oasis of natural beauty, Quarryhill is also a beacon of conservation and education in the North Bay. Each year, thousands of students get basic botany and garden lessons during half-day educational tours of the garden. All that work was feared lost last October, as the Nuns fire decimated the Sonoma Valley. McNamara was out of town when the fire began, and was told the garden, and his home on the property, were likely gone. "The garden somehow was miraculously spared," he says. "It came to our fence line, and then the fire stopped. We're not quite sure why." McNamara speculates that the garden's irrigation could have been a factor, and he knows firefighters were at his home from captured security camera footage, but he's still shocked that the garden survived. "We feel lucky, but it's hard to feel too lucky when so many people lost everything," he says. "We were one of the fortunate ones." After the initial cleanup, Quarryhill welcomed residents to the garden admission-free through the end of 2017, as a gesture to the community, "to have a place they could come to for solace after such a tragedy," says McNamara. This weekend, Quarryhill offers another chance for the community to see the gardens at an Earth Day celebration and plant sale on April 21. Activities will include arts and crafts, live dance and music performances, exhibits and more. "We tend to only look at things for their utilitarian value, but plants have intrinsic value," says McNamara. "I want people to see that and appreciate that plants are valuable in their own right."